The boating community exists in the boundary where land meets water, and today that boundary’s location is changing due to the impacts of global warming. Whether you hope to cruise San Francisco Bay where the backup of seawater into the sewage systems is a reoccurring problem, or race in Miami, FL where the ocean blankets the streets at high tide, global warming is currently impacting boaters all around the United States. By 2050, anticipated sea level rise will vary greatly along the 95,000 miles of U.S. coastline, but the consistent trend is that the tide is getting higher. In some locations – sea level rise is anticipated to be upwards of 2.3 feet in the next 36 years. The National Climate Assessment also looks at potential flooding events based on historic extreme weather events in a region such as spring high tides and hurricanes. When analyzing likeliness of storms such as Hurricane Sandy or Katrina – which were once predicted to occur “once every 100 years” – many coastal cities can expect that these will occur every five to twenty years. 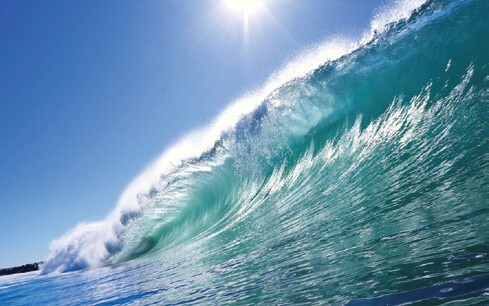 The ocean absorbs over 90% of the heat trapped by increasing levels of CO2 and other greenhouse gases in the atmosphere. This excess heat warms and expands the ocean, adding to sea level rise problems. Warming waters are also predicted to change ocean currents and circulation. With a 0.9°F rise in sea surface temperatures over the last century, ecosystem change can be seen in many areas of the ocean. In Hawaii and the Caribbean, coral bleaching is a persistent problem and only becoming worse. Coral bleaching occurs when water temperatures become too high, forcing reefs to expel the algae (zooxanthellae) that help nourish and give them their vibrant color. Coral reefs are essential spawning, nursery, breeding, and feeding grounds, and one of the most diverse ecosystems on the planet. Since the beginning of the industrial revolution, there has been an approximately 30% increase in surface ocean acidity. Along our coasts, regional differences in ocean pH occur as a result of variability in regional or local conditions. Additionally, coastal waters and estuaries can also exhibit acidification as the result of pollution and excess nutrient inputs, such as fertilizer runoff. Sailors and boaters can help mitigate this by using environmentally safe cleaning products and using compost, rather than toxic fertilizers at home or on marina lawns. Today, more than 50% of Americans, 164 million people, live in coastal counties, and every year 1.2 million more are added. This places heavy demands on the unique natural systems and resources that make our coastal areas so attractive and productive. Coastal ecosystems provide many valuable benefits such as reducing flood impacts, buffering from storm surge and waves, providing nursery habitat for important marine species, water filtration, carbon storage, and opportunities for recreation and enjoyment. Coastal ecosystems in the United States have long faced environmental struggles. It’s time we start preserving and restoring these vital habitats. We need to act now to embrace big solutions to big problems that reduce the human carbon footprint. Be a part of the 10% – If 10% of the registered vehicles in the U.S. drove one mile less a day, it would eliminate 22 million tons of C02 emissions – the same amount that the ocean absorbs every day. Adaptation: After storms, don’t rebuild in the area that was destroyed, and work with your local government to prepare for sea level rise.